In American football each team has 11 players on the field at one time. The specific role that a player takes on the field is called their position. Under the modern rules of American football, teams are allowed unlimited substitutions; that is, teams may change any number of players after any play. This has resulted in the development of three "platoons" of players: the offense (the team with the ball, which is trying to score), the defense (the team trying to prevent the other team from scoring, and to take the ball from them), and the special teams (who play in kicking situations). Within those platoons, various specific positions exist depending on what each player's main job is. One of the most confusing things about football, especially when you are just starting to get into the sport is where are all these guys standing and why are they there? What are the different positions that we have in football? That is what I want to take a look at in this video. If you are afraid of geometry, you don't need to be because we are not going to get any more complicated than the X's and the O's. The O's represent the players on offense, the X's are the guys on defense. We'll take a look at each of them here. The first thing to note is is that there is a line separating the offense from the defense. This is because the ball will be placed in the middle. it is separated by this law in the offense guys cannot The offensive nor the defensive guys can go over this line or they would be considered 'offside.' This yellow line is called the 'Line of Scrimmage.' And the line of scrimmage separates the offense from the defense that is where the ball is. First, lets take a look at the guys on offense, who are these O's down here. The offense starts with the 'offensive line,' who are the orange circles. As you can see, there are five men on the offensive line. The man in the middle, is fittingly called the 'Center.' The center is going to be the man who snaps the ball back to the 'Quarterback.' The quarterback is the grey guy standing behind the center, we'll get back to him in a second. On either side of the center, we have our other offensive lineman. On the left side, we have our 'Left guard,' who stands right beside the center. And to his left we have the 'Left tackle.' This is different than we'll be talking about as far as "tackling a player." In this case it is simply the name of his position. You can probably guess that on this side to the right of the center, we have the 'Right guard' and on the outside we have our 'Right tackle.' These offensive linemen their job is to stand there and prevent the defense from getting to the quarterback. Because the quarterback is going to have the ball, and we'll see that the defense is going to want to "tackle" or to pull down the guy who has the ball. The offensive linemen are usually big guys and their job is to stop the defense from getting to the ball and the quarterback. So there are our five offensive lineman. As we said, right behind me offensive line is the quarterback. The center is going to snap the ball back to the quarterback and the quarterback then has a decision: he can either pass the ball or he can hand off the ball. For a hand off, he would turn to one of these guys behind him. Back here are two, misnamed guys in the 'Fullback' and the 'Halfback.' Although as you can see, you might think they are backwards because the fullback should be further back than the halfback, but that's not the case. That is just the way they are named. Either way, these guys are both considered 'Running backs.' So if the quarterback does decide to hand the ball off he will turn around with the ball, and usually--it can be to either player--but usually he will hand off to the halfback. And the halfback would then run with the ball. If the quarterback does decide to pass, he can pass to one of these guys way out on the end, called 'Wide receivers.' The man on the left is another wide receiver. Our final guy, in actuality he is closer to the offensive line. He is called the 'Tight end.' Sometimes will will run and receive, other times he is like a sixth offensive linemen by blocking. And these are all of the positions on offense. I'm not sure if I mentioned it or not, but there are 11 guys both on offense and defense. It is not required that they line up like this, typically this is what you will see, but it is not required. Sometimes the wide receiver will be out further and instead of a tight end we'll have a third wide receiver and he'll line up out here. So you could have three wide receivers and no tight ends on the field. Or maybe you only have one running back and one of these guys is free to move up and become a second tight end or maybe a third wide receiver. There are eleven guys, but they can exchange by running on and off the field between each play. It does not even have to be what you did on the last play. Those are our offensive positions. Moving to defense now, you can see that opposite the offensive line they are lined up in a different way because their goal is to try to stop their goal was to try to to stop whoever on offense has the ball. Just like the offense, they are not required to line up in this way, but they are currently lined up in what is called a '4-3 defense.' Let's look at where these numbers come from. The four, or the first number, comes from the line. This is the 'defensive line.' As you can see there are four guys, which is where we get the four Then there are three guys behind them. And if you guessed this is where the three comes from, you are correct. We have four defensive linemen, and three 'linebackers' because they're behind the defensive line. So this is where we get the 4-3. Then on both sides, usually defending the wide receivers, are we have the 'Cornerbacks' Not to be confused with the Quarterback, these are Cornerbacks. And then the two guys back here, who are usually pretty fast guys, these are the 'Safeties.' Sometimes you'll have a 'Strong safety' and the other guy is known as a 'Free safety.' Again this is not the required way that these guys line up, just like offense they have some leeway in how they want to position their players. The other common way that you might see them lined up, other than a 4-3 is a '3-4 defense' which would mean that one of the linemen will move back so that you will have three linemen and four linebackers and that is the 3-4 defense. These guys can stand wherever they want, sometimes you see these guys come up closer to the line, but technically you still have four linebackers and three defensive linemen. Overall though, that's the basic layout of the positions. You have your safeties in the back, linebackers, your defensive line, and two cornerbacks on defense. Again, either team can swap players between each play if they want to there's really no requirement of any one guy standing in one place they can move around and try to confuse the offense, but we'll get into that when we talk about more of the strategy involved in the game. In American football, the offense is the side in which the players have possession of the ball. It is their job to advance the ball towards the opponent's end zone to score points. Broadly, the eleven players of the offense are broken into two groups: the five offensive linemen, whose primary job is to block, and the six backs and receivers whose primary job is to advance the ball either running with the ball or passing it. The backs and receivers are also commonly known as skill position players or as eligible receivers (or eligible ball carriers). Offensive linemen are not eligible to advance the ball past the line of scrimmage during a play. The organization of the offense is strictly mandated by the rules; there must be at least seven players on the line of scrimmage and no more than four players (known collectively as "backs") behind it. The only players eligible to handle the ball during a normal play are the backs and the two players on the end of the line (the "ends"). The remaining players (known as "interior linemen") are "ineligible" to catch forward passes, so they usually only block. Within these strictures, however, creative coaches have developed a wide array of offensive formations to take advantage of different player skills and game situations. The center is the player who begins the play from scrimmage by snapping the ball to the quarterback. As the name suggests, the center usually plays in the middle of the offensive line, though some teams may employ an unbalanced line where the center is offset to one side. Like all offensive linemen, the center has the responsibility to block defensive players. The center often also has the responsibility to call out blocking assignments and make last second adjustments depending on the defensive alignment. Penn State Nittany Lions quarterback No. 14 Anthony Morelli hands the ball off to his running back, No. 33 Austin Scott, in their 2007 season opener. The quarterback is the player who receives the ball from the center to start the play. The most important position on the offensive side, the quarterback is responsible for receiving the play from the coaches on the sideline and communicating the play to the other offensive players in the huddle. The quarterback may need to make changes to the play at the line of scrimmage (known as an "audible"), depending on the defensive alignment. At the start of the play, the quarterback may be lined up in one of three positions. If they are positioned directly in contact with the center and receives the ball via the direct hand-to-hand pass, they are said to be "under center". If they have lined up some distance behind the center, they are said to be in "shotgun formation". They can also be in between. This is called a "pistol formation". Upon receiving the snap, the quarterback has three basic options to advance the ball. They may run the ball, they may hand it to another eligible ball carrier to run with it, or execute a forward pass to a player downfield. Running backs are players who line up behind the offensive line, in a position to receive the ball from the quarterback and execute a rushing play. Anywhere from one to three running backs may be utilized on a play (or none, a situation typically known as an "empty backfield"). Depending on where they line up, and what role they have, running backs come in several varieties. The "tailback" (or sometimes the "halfback") is often a team's primary ball carrier on rushing plays. They may also catch passes, often acting as a "check-down" or "safety valve" when all other receivers on a pass play are covered. The "fullback" is often larger and stronger than the tailback, and acts primarily as a blocker, though the fullback may also be used for catching passes or for rushing as a tailback does. Fullbacks often line up closer to the line of scrimmage than tailbacks do, so they may block for them. A "wing-back" or a "slot-back" is a term for a running back who lines up behind the line of scrimmage outside the tackle or tight end on the side where positioned. Slot-backs are usually only found in certain offensive alignments, such as the flexbone formation. A similar position, known as the "H-back", is actually considered a modification of the normal tight end position. Wide receivers are pass-catching specialists. Their main job is to run pass routes and get open for passes, although they are occasionally called on to block. Wide receivers generally line up split "wide" near the sidelines at the start of the play. Wide receivers, like running backs, come in different varieties depending on exactly where they line up. A wide receiver who is directly on the line of scrimmage is called a "split end", and is counted among the seven required players on the line of scrimmage. A wide receiver who lines up behind the line (and thus counts as one of the four backs) is called the "flanker". A wide receiver who lines up between the outermost wide receiver and the offensive line is said to be "in the slot" and is called the "slot receiver". Tight ends play on either side of, and directly next to, the tackles. Tight ends are considered hybrid players, something between a wide receiver and an offensive lineman. Because they play next to the other offensive linemen, they are frequently called on to block, especially on running plays. However, because they are eligible receivers, they may also catch passes. The position known as the "H-back" is a tight end who lines up behind the line of scrimmage, and is thus counted as one of the four "backs", but otherwise their role is similar to that of other tight ends. Depending on the style of offense the coaches have designed, the game situation, and the relative skill sets of the players, teams may run formations which contain any number of running backs, wide receivers, and tight ends, so long as the mandated "four backs and seven on the line" rule is followed. For many years, the standard set consisted of the quarterback, two running backs (a tailback/halfback and a fullback), two wide receivers (a flanker and a split end) and a tight end. Modern teams show a wide variety of formations, from a "full house" formation with three running backs, two tight ends, and no wide receivers, to "spread" formations featuring four or five wide receivers, sometimes without any running backs. The "I formation" is one of the most common. The defensive team or defense is the team that begins a play from scrimmage not in possession of the ball. The objective of the defensive team is to prevent the other team from scoring. The defense accomplishes this by forcing the offense to turn the ball over, either by preventing them from achieving a first down and forcing a punt, forcing the offense to fumble or throw an interception, or more rarely, forcing a turnover on downs. Sometimes called a "defensive guard", defensive tackles play at the center of the defensive line. Their function is to rush the passer and stop running plays directed at the middle of the line of scrimmage. The most interior defensive tackle who sometimes lines up directly across from the ball (and therefore is almost nose-to-nose with the offense's center) is often called a "nose tackle", alternately "nose guard" or "middle guard". The nose tackle is most common in the 3-4 defense. Most defensive sets have one or two defensive tackles. If one employs a second defensive tackle, sometimes called an "under tackle", they are usually a bit faster than the nose tackle. The two defensive ends play next to the defensive tackles, at the edges of the defensive line. Their function is to attack the passer or stop offensive runs to the outer edges of the line of scrimmage (most often referred to as "containment"). The faster of the two is usually placed on the right side of the defensive line (quarterback's left) because that is a right-handed quarterback's blind side. This defense (in white) is in a base 4-3 set. Just behind the four defensive linemen (whose hands are on the ground) are three linebackers (Nos. 55, 3 and 16), and further back are two safeties (numbers 24 and 44). Sometimes called the "inside linebacker" (especially in a 3-4 defense), and known colloquially as the "Mike" linebacker, the middle linebacker is often known as the "quarterback of the defense", as they are frequently the primary defensive play callers and must react to a wide variety of situations. Middle linebackers must be capable of stopping running backs who make it past the defensive line, covering pass plays over the middle, and rushing the quarterback on blitz plays. Outside linebackers are given different names depending on their role and the philosophy of the team. Some teams keep their outside linebackers on the same side of the field at all times. Some teams define them by their role; as playing either "strongside" (SLB) or "weakside" (WLB). The strongside, or "Sam", linebacker lines up on the same side as the offensive tight end and often is responsible for covering the tight end or running back on pass plays. The weakside, or "Will", linebacker lines up on the side of the offensive line without a tight end, and is often used to rush, or blitz the quarterback, or may need to cover a running back on pass plays. Defensive backs, also known as the "secondary", play either behind the linebackers or set to the outside, near the sidelines. 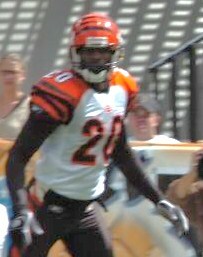 Defensive backs are primarily used to defend against pass plays. Defensive backs also act as the last line of defense on running plays and need to be able to make open field tackles, especially when the ball carrier has gotten past the other defenders. A normal complement of defensive backs includes two cornerbacks and two safeties, though specialty defensive backs (nickelbacks and dime backs) can be brought in in place of linebackers and defensive linemen, when there is a need to cover additional pass receivers. Cornerbacks attempt to prevent successful passes by either swatting the airborne ball away from the receiver or by catching the pass themselves. In rushing situations, their job is to contain the runner, either by directing them back to the middle of the field to be tackled, by tackling them themselves or by forcing them out of bounds. A placekicker (Mason Crosby, No. 2) prepares to kick the ball from the hand of a holder (Jon Ryan, No. 9). "Special teams" redirects here. For the ice hockey definition, see Power play (sporting term) and Short handed. Also called a "placekicker", they handle kickoffs, extra points, and field goals. All three situations require the kicker to kick the ball off of the ground, either from the hands of a holder or off of a tee. Some teams employ two kickers: one kicks extra points and field goals, and the other, known as a "kickoff specialist", handles kickoffs. Most, however, use a single kicker for both jobs, and rarely, the same player may also punt. Usually positioned 7–8 yards from the line of scrimmage, they hold the ball for the placekicker to kick. The holder is often a backup quarterback or a punter because of their "good hands", feel for the ball and experience taking snaps from the long snapper (center) during plays from scrimmage. A holder is occasionally used on kickoffs if the weather or field conditions repeatedly cause the ball to fall off the tee. A specialized center who snaps the ball directly to the holder or punter. The long snapper is usually distinct from the regular center, as the ball often has to be snapped much farther back on kicking plays. Kickoff specialists are exclusively used during kickoffs. Teams employ kickoff specialists if they feel neither their kicker nor punter is good enough at kicking off. Due to their specialized nature and the limited number of active roster spots, professional KOSs are rare.